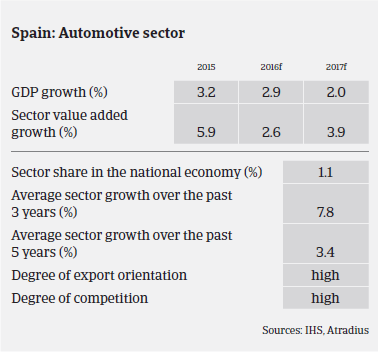 The Spanish automotive sector is a key sector in the country’s economy, as it accounts for 10% of the Spanish industry sectors´ share of GDP and about 9% of employment. Spain is the second largest car manufacturer in Europe, after Germany, and ranks number nine globally. Nine original equipment manufacturers (OEM) are active in Spain, with a total of 17 production plants. The automotive component producers subsector plays an important role for the sector´s performance. Three of the largest car component producers worldwide are Spanish businesses, with good performance in Europe, Asia and the NAFTA region. 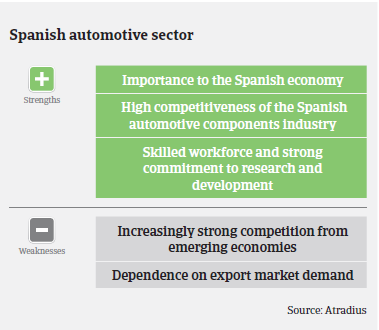 Automotive is Spain’s second largest export industry with more than 85% of the national production exported. In 2015 the Spanish automotive sector performed well, as production and capacity utilisation returned to pre-crisis levels. Spanish car production increased 12.7%, to more than 2.7 million units. Automotive exports increased 11.4% by units and 18% by value, to EUR 31.7 million. This upswing continued in 2016, with domestic car production increasing 11.2% year-on-year in H1 of 2016, to more than 1.6 million units, according to the Spanish car manufacturers association ANFAC. Exports increased 12.3% in H1 of 2016. In addition to rising exports, the Spanish car industry continues to benefit from the on-going economic rebound of the domestic economy. Car sales in Spain increased by more than 12% in H1 of 2016, to more than 620,000 units, due to robust private consumption and a decreasing unemployment rate, increased access to bank financing for consumers and government schemes supporting the renewal of vehicle fleets and purchase of electric models. The profitability of Spanish automotive businesses has generally increased over the past 12 months, and profit margins are expected to remain stable in 2016. 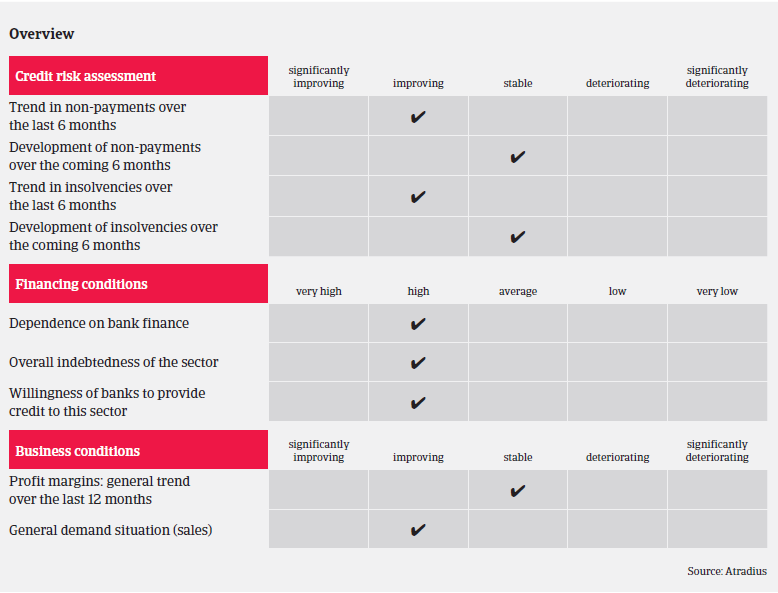 While external financing requirements and gearing are generally high in this sector, banks are increasingly willing to provide credit to this industry, for both short-term financing (working capital management) and long-term facilities (i.e. capital expenditure financing). On average, payments in the Spanish automotive sector take around 60 days. Payment experience is good, and the level of protracted payments has not been overly high over the past couple of years. Non-payment notifications are low, and we do not expect major increases in the coming months due to the still positive outlook for automotive performance. The level of insolvencies in this sector is low, and this is expected to remain unchanged in the coming six months. While the outlook for the remainder of 2016 and for 2017 remains generally benign, some downside risks remain: the economic recovery in the eurozone remains fragile, and the domestic car market could be negatively affected by the on-going political uncertainty. The persistent lack of a government with a stable majority in parliament could severely hurt domestic consumption and investment in Spain. That said, our underwriting stance for the automotive sector has become more relaxed than in previous years. There are no major restrictions in our underwriting stance for large companies and strong international groups. However, we are still more cautious with small and medium-sized car parts suppliers who are highly geared. Insolvencies across advanced markets are forecast to be flat in 2016 and 2017. Atradius identifies the most vulnerable countries and sectors in Europe to Brexit. The impact will be most acute in Ireland, Netherlands, and Belgium.